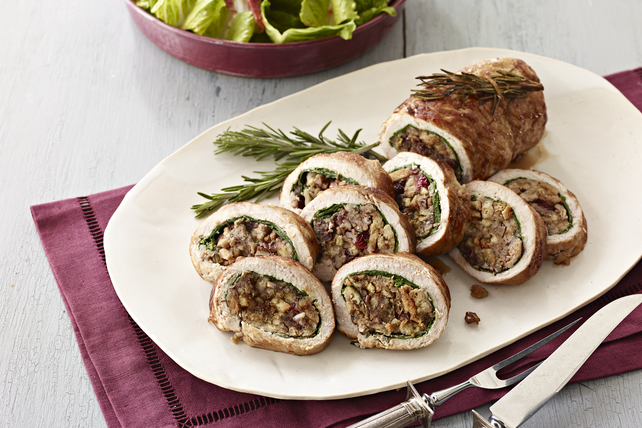 Fresh rosemary, dried cherries and crunchy pecans in the stuffing makes this pork loin roast a winner. See how to make it in this step-by-step video. Chop 1 rosemary sprig finely. Melt butter in medium saucepan on medium heat. Add celery; cook and stir 4 min. or until crisp-tender. Remove from heat. Add chopped rosemary, water, cherries and nuts; mix well. Stir in stuffing mix just until moistened. Place roast on cutting board with short ends at 12 and 6 o’clock. Holding a sharp knife parallel to work surface, make 1/2-inch-deep lengthwise cut through underside of roast, pulling back meat with your free hand and unrolling it as you continue to cut through roast. (You should end up with a piece of meat that is about 1/2-inch thick and 3 times the size of the original roast.) Cover meat with plastic wrap; pound to even thickness. Brush cut side of meat with 1/4 cup dressing; top with spinach and stuffing mixture, leaving 1-inch border around all sides. Roll up tightly, starting at one long side. Tie closed with kitchen string. Tuck remaining rosemary sprigs under string. Place in shallow pan; brush with remaining dressing. Bake 20 min. Reduce oven temperature to 375ºF; continue baking 15 to 20 min. or until meat is done (145°F). Remove from oven; cover loosely with foil. Let stand 5 min. before slicing to serve. Serve with a mixed green salad and glass of fat-free milk to round out the meal. Prepare recipe as directed except do not bake. Refrigerate up to 24 hours. When ready to serve, bake as directed, increasing the baking time if necessary until meat is done.